The Golden Conure, Guarouba guarouba, formerly classified as Aratinga guarouba, is also known as the Golden Parakeet or the Queen of Bavaria Conure. It belongs to a group commonly referred to as conures in aviculture. Its plumage is bright yellow, hence its common name, but it also possesses green remiges. It lives in the drier, upland rainforests in Amazonian Brazil, and is threatened by deforestation, flooding and the capture of wild individuals for aviculture. Golden Conures are playful and sociable, and may even adopt unrelated birds. This behavior is less common with conures in captivity, who often abandon their young after three weeks. They eat fruits, flowers, buds, seeds, and cultured maize in the wild, but prefer certain types of foods. These include the seed of Croton matouensis, which is related to the castor bean plant; Muruci fruit ; mangoes; and Açaí fruits. After the Conure reaches sexual maturity at the age of three years, the breeding season starts in November and runs through February. They nest in a high tree, and lay an average of four 37.1 x 29.9 millimeter eggs, which they aggressively guard. The incubation period is about 30 days, in which the male and female take turns incubating. 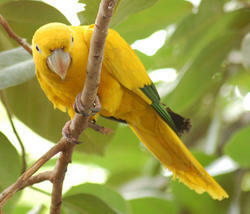 In the first few years of sexual maturity, golden conures tend to lay infertile clutches until the age of six to eight. In captivity, golden conures will resume breeding when their chicks are taken from them. At birth, Golden Conures are covered in white down that eventually turns darker within a week. By the end of the third week, wing feathers start to develop. Juveniles are playful, but may turn abusive against their peers. The Golden Conure listed on the IUCN Red List as endangered. This is largely due to deforestation and the capture of wild birds for aviculure, where in high demand due to the attractiveness of its plumage. Locally, they are considered as pests for feeding on crops, and are hunted for food or sport. An example of the displacement of Golden Conures by habitat loss comes from the building of the Turucuí Dam from 1975-1984. More than 35,000 forest dwellers were forced from what had been a habitat that was considered to be "among the richest and most diversified in the world." In addition, 2,875 square kilometers of rainforest were flooded, and 1600 islands were produced by the flooding, all of which were heavily deforested.